I finished the tie dye quilt top ….it is about 60″ square. I was not sure if I wanted to add a border and make it bed sized, but once I hung it up to look at it I decided It was done. 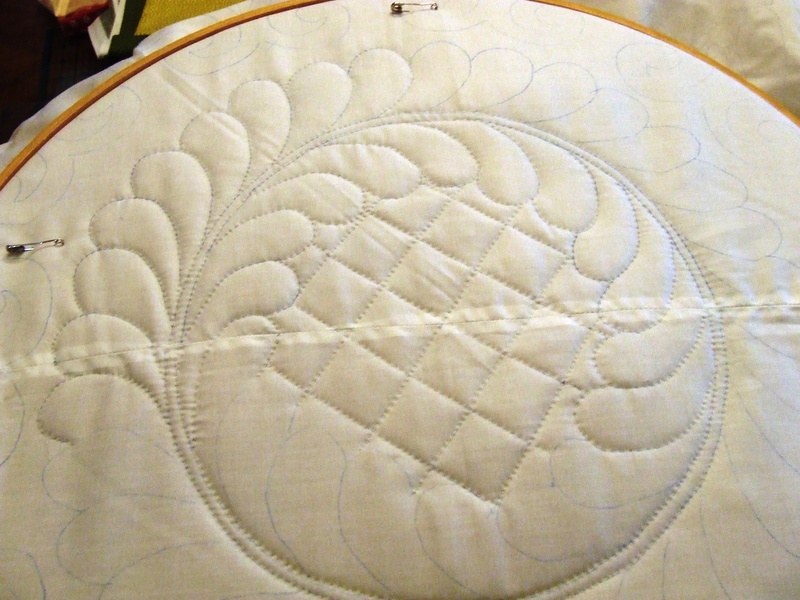 This should get the oddball out of my system long enough to finish up hand quilting the whole cloth quilt I have been working on. I do have backing fabric, batting and hand quilting thread (12 weight for big stitch quilting) for the tie-dye quilt so I might not be able to resist working on it as well……but I want to get the whole cloth finished! 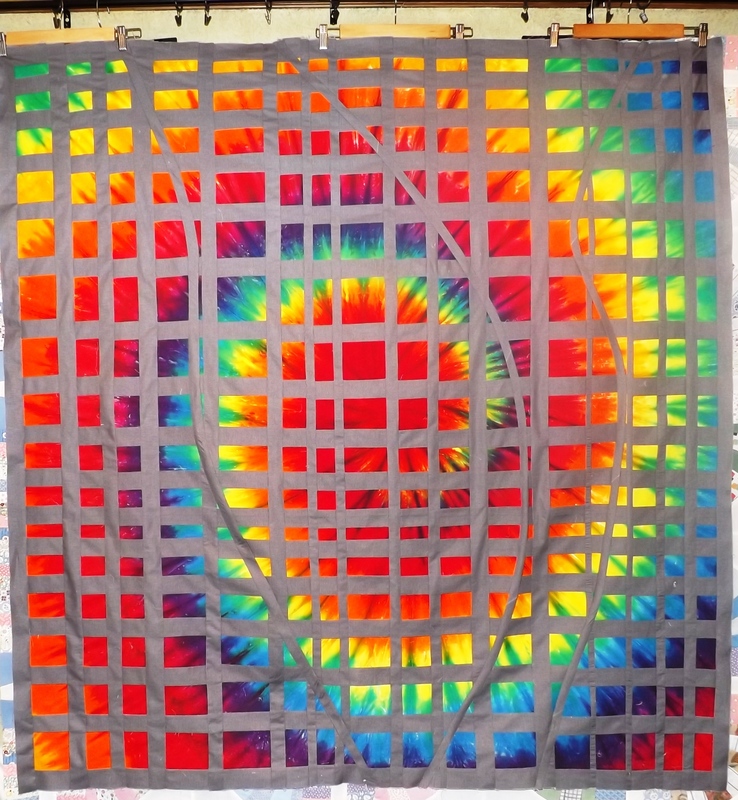 This entry was posted in Quilts and tagged hand quilting, Quilting, Quilts, tie-dye fabric, whole cloth quilt. Amazing tie dye!! Love the way you seperated it. I too hope you can resist long enough. I want to see that wholecloth in it’s entirety.. Thanks!….I hope to see such bright colors blooming in my garden soon! Wow! That is a beautiful piece. Really striking and so different! 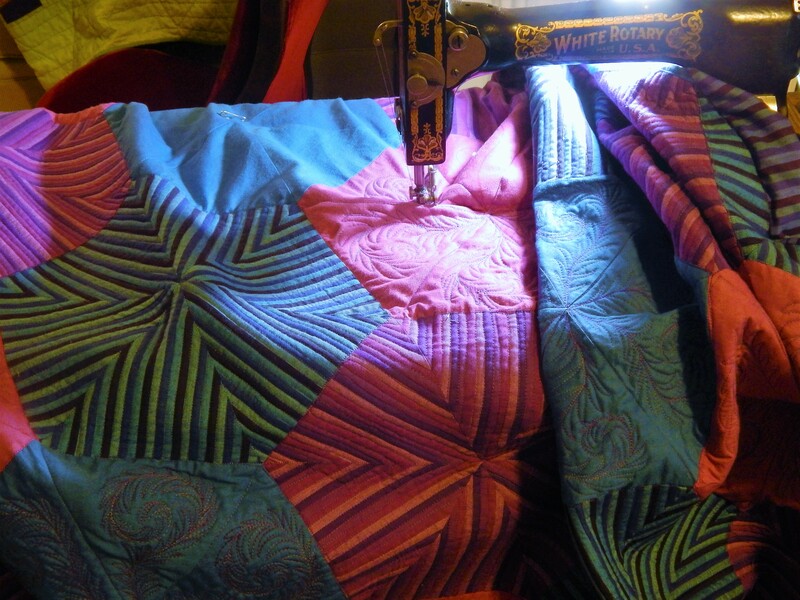 Now I can get back to the comfort zone of hand quilting….it is so much more relaxing than working at the machine! Tim, what size and brand needle do you use for big stitch quilting? The embroidery needles I’ve found feel like small posts. LOL!…I do use a big embroidery needle like a size 5 and the seem huge until I get used to them! Wow! That’s really different from what you usually do. The gray makes an excellent framework for the bright explosion of color behind it. I think we all probably have some quilting extremes and not being afraid to work on both probably helps bring out the best in us all. Thanks for sharing! Very, very different!~ I like it!~ Very unique. it is going to take some time to finish….seems like it went a lot faster a few months ago…lol…. Wow surprised to see this on your blog! I do like it though and it would be fun to quilt. 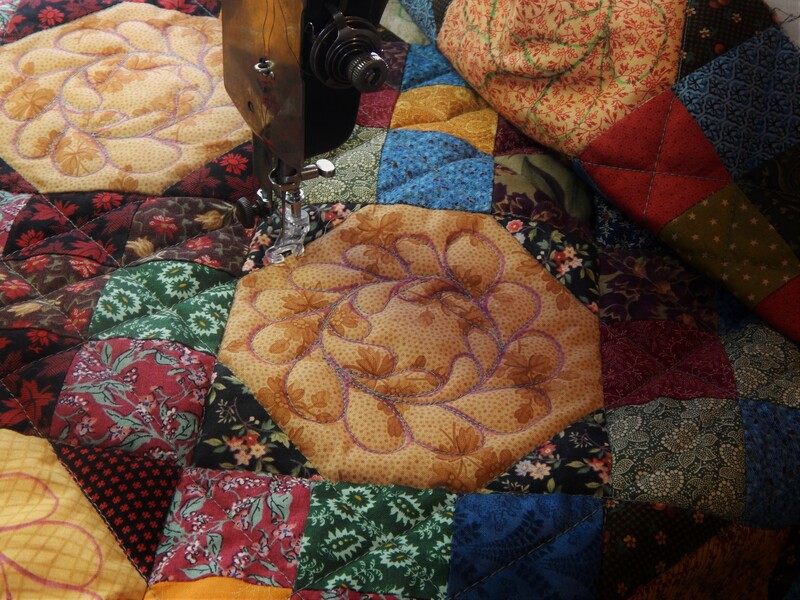 love, love, love the hand quilting on the whole cloth quilt and looking forward to seeing it done! I love your quilt. The colors are great. 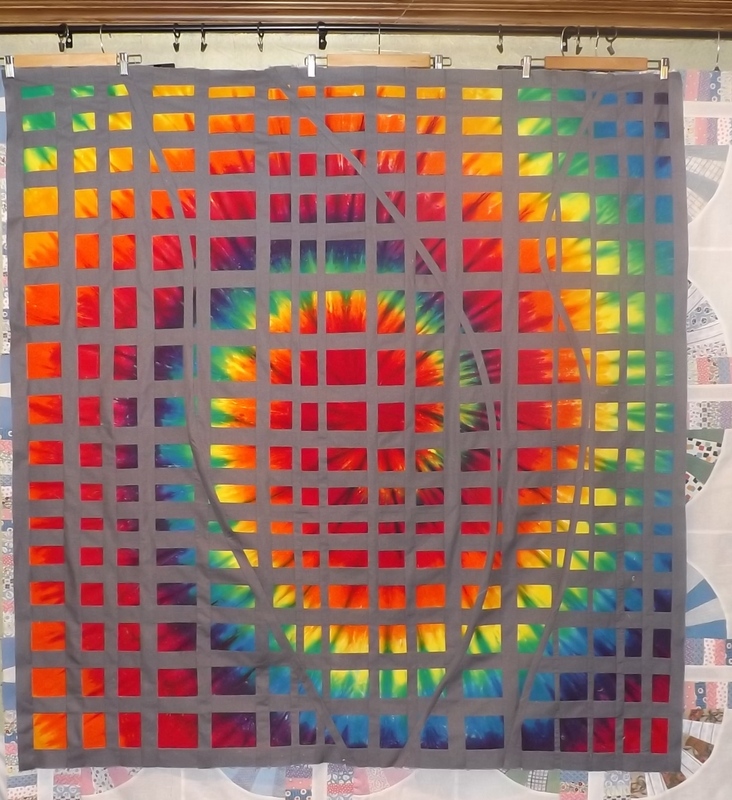 I’ve never seen a tye dye quilt before. The framing is perfect. Thanks for sharing! I am excited to see it quilted. I love all your quilts. You do great work. Teddy looked cute with the tye dye fabric the other day. The whole cloth quilt is looking gorgeous congratulations. 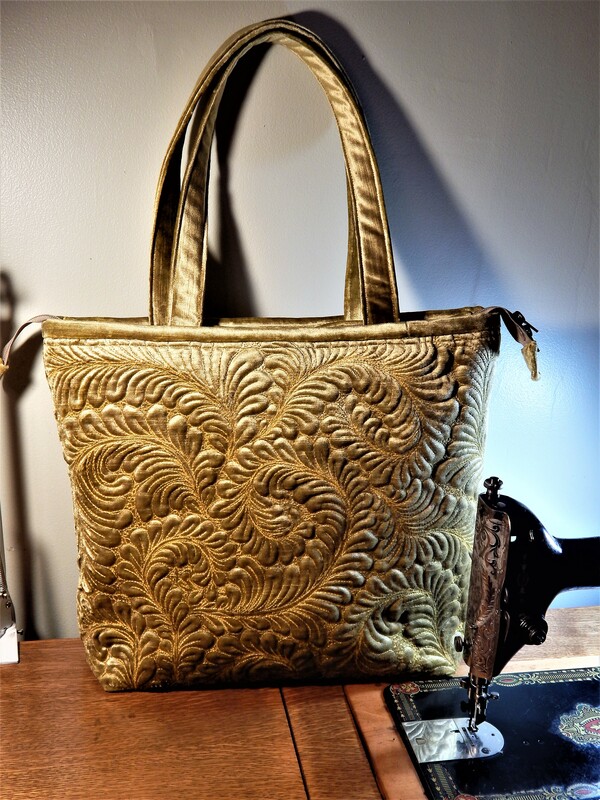 Thanks Lisa!…this is not the style for everyone…..but I am glad that you like it!…I do too!